Apparently I’m ranting too much and need to retrieve my sense of humour, so here is my nod at levity. One reason for my grumpiness could be an impending, significant birthday. Well, it’s not so much the birthday as the physical defects that accompany it. My back aches when I garden, my hips give me gyp when I walk, and so on. Not that I’m grumbling, well, I’m trying not to, it’s just that the other day I got stuck in the bath. You may laugh. Well, I suppose I find it funny now, as long as I avert my inner gaze from the image of my body, a ball of slick blubber, slithering helplessly on the lubricated surface that was the base of the bath. Having completed my ablutions, and lain in the fragrant suds until the surface of the water had become chilly, I bent my knees and planted my feet flat on the base of the bathtub. Placing my hands on the sides I began to heave myself upwards. Sadly, with one flex of my biceps, the soles of my feet went from horizontal on the bottom of the bath, to horizontal in the air, while the rest of my body slid down the bath until my head was under the water and I was flailing around like a cross between an upturned beetle, and a roseate manatee. Water slopped onto the lino as my elbows sought purchase, without success. Manatee at Columbus Zoo, Ohio, by Chris Muenzer. The danger of drowning gives rise to rapid, involuntary action by the body, and by some manoeuvre I can’t even remember, I turned myself onto my front and managed to raise myself onto hands and knees, then, rather shaken, out of the bathtub. The doleful thought came upon me that perhaps I could no longer bath in safety. 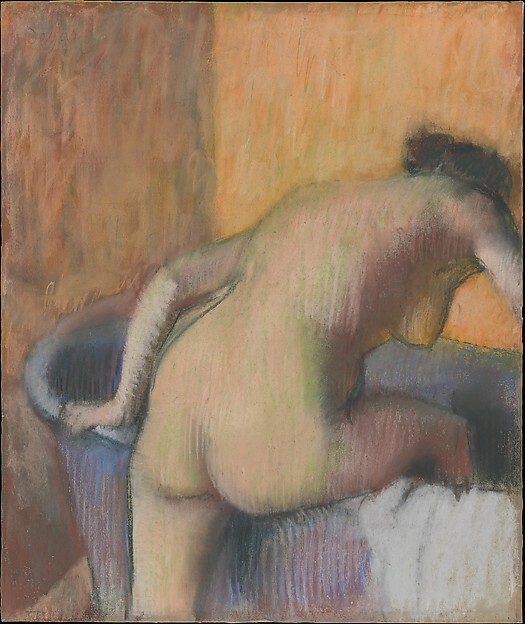 I don’t bath that often – a busy woman tends to head for the shower – but after a hectic week, or more than usual physical effort, a soak in the tub, with an accompanying glass of wine is a luxury to be protected if at all possible. As I wrapped myself in a robe I raised my eyes to the plastic shower mat hanging on the shower screen. One of those things you spread on the base of the bath to save you from slipping while having a shower. Now why should I not sit on that? It might work. The thought delighted me, and when it further occurred to me that I could blame those little holes that punctured its surface, for the dimples on my buttocks, I was convinced.